According to the specific conditions of the region, we sought to determine appropriate soil materials for improving soil conditions after the reclamation of hollow villages into cultivated land and for quickly restoring agricultural production. The test plot consisted of seven treatments with an area of 5 m × 6 m (30 m2) each, and each treatment included three replicates. The plot was filled with raw soil (old wall soil) from an abandoned homestead in Yuzihe Village, Yaotou Town, Chengcheng County, Shaanxi Province, China. The test design was completely randomised with seven treatments: fly ash (T1), organic fertiliser (chicken manure) (T2), improver (ferrous sulphate) (T3), fly ash + organic fertiliser (T4), improver + organic fertiliser (T5), fly ash + improver (T6) and no fertilisation measures (T0). The modified materials were mixed evenly with raw soil then applied to a depth of 0–30 cm onto the test plot. After adding the various modified materials, the soil bulk density decreased by 6.52–14.49% and total soil porosity, capillary porosity and non-capillary porosity increased by 7.09–15.75%, 3.14–12.67% and 15.57–38.47%, respectively. 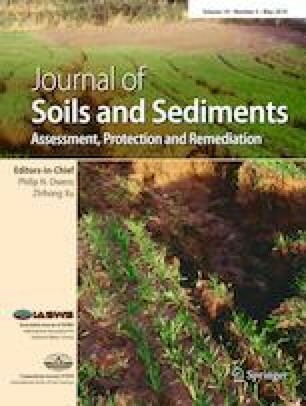 The soil permeability coefficient increased by 5.75–10.75×. Organic matter, total nitrogen, available phosphorus and available potassium in reclaimed hollow village soil increased by 12.50–66.44%, 15.15–20.00%, 6.58–64.62% and 18.24–26.82%, respectively, relative to that of T0. Only T4, T2, T6 and T5 significantly increased maize yield and water use efficiency compared with T0. The other treatments did not significantly improve maize yield or water use efficiency. Organic fertiliser and fly ash composite was an appropriate amendment for improving reclaimed soil in a hollow village in a loess hilly gully region. This work was supported by national natural science foundation of China (41671285), the national key research and development program of China (2016YFC0501707, 2016YFC0402401), the science and technology innovation team of degradation and unused land reclamation engineering (2016KCT-23).